Hope many of you had a great holiday weekend. Here in NY we are getting the summer we haven't had in over 3 years with temps reaching 100+ @_@. This past weekend was a crazy one; my anime figure sales were through the roof (still in the process of boxing some stuff), Anime Expo was in full swing out on the west coast, with Danny Choo being one of the guests of honor, many anime series got licensed by American anime companies, including K-On! by...Bandai America? FUNimation once again on their buying spree, fueled by more DBZ and DB Kai money; it was Fourth of July weekend, "human sacrifice, dogs and cats living together... mass hysteria! "*...you get the picture. Another bit of news within the chaos was that the last episode of Fullmetal Alchemist Brotherhood (ep. 64 I believe) was added to the FUNimation channel/stream. I refused to watch it since I've seen probably about 10 episodes spread way too far apart..thus not wanting risk spoilers. My fiancee, Danielle has of course seen every episode so some spoilers I failed to dodge. One bit of info the last episode brought, as per this ANN post, was that an FMA: Brotherhood movie has been green lit, so that's great news for all of us FMA fans. 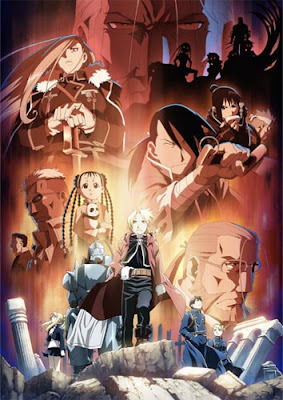 If you have read the manga, you probably have a good idea how it will go since it's going to match the recent end of the FMA manga by creator, Hiromu Arakafwa.